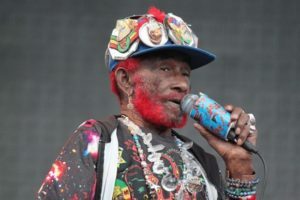 At age 81, one of the music world’s most senior artists, reggae-dub pioneer Lee “Scratch” Perry re-emerged triumphant on the airwaves of Asheville FM during the week of January 14 through 20, 2018, with a healthy cross-section of deejays playing cuts from Scratch Perry’s latest album Super Ape Returns to Conquer (#1), especially in anticipation of Perry’s January 19 show at new Asheville music venue Ellington Underground downtown (prior to, AFM promotions successfully gave away concert tickets to listeners who called in), vaulting Scratch Perry to the topper-most popper-most of AFM’s play chart. The closest contenders to Scratch were Alvarius B. (with his dozenth album since 1994, With a Beaker on the Burner & An Otter in the Oven (#2), by this Sun City Girls member, hailed as a modern songwriting classic) and the Australian psych-music-holics King Gizzard & The Lizard Wizard, whose 4th album of 2017, Polygondwanaland (#3), glides into this new year with popular radio play as tickets for King Gizz’s June 19 concert at The Orange Peel went on sale recently. Destroyer’s upcoming January 29 show at The Grey Eagle factored in as his Merge Records album Ken (#4) received revived AFM airplay, plus ticket gives. Asheville’s omnipresent Angel Olsen continues to serenade from her odds’n’ends album, Phases (#5). Headroom’s Head In The Clouds 5-song EP (#6) by this New Haven, Connecticut band has made a psychedelic presence in AFM’s Top Ten, joined by previous #1 (gospel-soul vet) Mavis Staples (#7), Jay Som (#8) (Oakland, California-based songwriter Melina Duterte) emerging from the aether, and interlopers Naked Naps (#9) (Raleigh, NC, indie rock duo, who recently played The Odditorium) and The Prids (Portland, Oregon, noisy-pop) (#10). As well, there was much love and remembrance for Cranberries vocalist Dolores O’Riordan who unexpectedly passed away at the start of the week, January 15, 2018, age 46. AFM deejays played no less than 10 different Cranberries songs in her honor, bless in peace.